A giant war room of diversity advocates in Silicon Valley has formed under the name Project Include. The effort consists of former Reddit interim CEO Ellen Pao, Pinterest engineer Tracy Chou, Kapor Capital Partner Freada Kapor Klein, Slack engineer Erica Baker, ReadySet founder Y-Vonne Hutchinson, angel investor Susan Wu, Cathy Labs CEO bethanye McKinney Blount and Atipica CEO Laura I. Gómez. Project Include, a non-profit organization, aims to be a resource for people to implement change around diversity and inclusion in the tech industry. The project is focused on small to mid-stage startups, meaning anywhere from 25 to 1,000 employees, according to the New York Times. Project Include’s set of recommendations for CEOs, leaders and managers at startups aim to help them both foster and accelerate diversity and inclusion inside their respective companies. The goal is to get startups to commit to tracking diversity and inclusion, and ultimately share that data with the tech community. What you see above is the result of a roughly 85-page document on best practices for startups to become more inclusive. 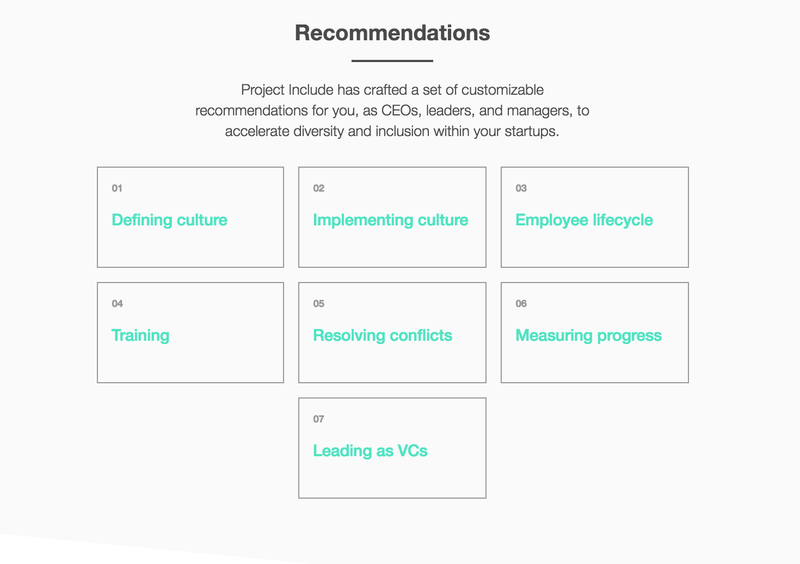 If you decide to explore Defining Culture, for example, you’ll see recommendations like “commit to inclusivity in the company culture,” “include transparency in company values and culture” and “define and share clear compensation bands.” Project Include also offers recommendations for VC firms like applying metrics to portfolio reports and valuing the effort it takes to go into diversity and inclusion efforts. One section that really hits home for me is around measuring progress. The last couple of years have been filled with diversity reports with stats around gender, race, POC and women in leadership positions and technical roles, and so on. In the last few months, we’ve started seeing stats around LGBTQIA populations at companies as well as representation of people with intersectional identities, such as POC and female, or POC and LGBTQIA. But we have yet to see any sort of standard best practices emerge for reporting diversity and inclusion, until now. If you want to hear more about Project Include, I’ll be talking to Erica Baker next week at TechCrunch Disrupt NYC.